Stephanie Bachman, OTD, OTR/L, CHT has been an occupational therapist for over 14 years. Her experience has been in a variety of settings including acute care and outpatient hand therapy. 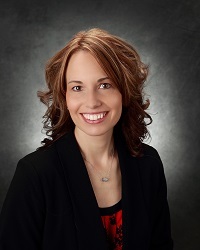 Dr. Bachman received her bachelor's degree in occupational therapy from Xavier University in Cincinnati, Ohio and her clinical doctorate in occupational therapy from Rocky Mountain University of Health Professions in Provo, Utah. In 2005, she obtained her certified hand therapist (CHT) credential from the Hand Therapy Certification Commission. Dr. Bachman currently serves as an item-writer validator for the national CHT examination and as a critically appraised paper reviewer for the American Occupational Therapy Association. She contributed to two chapters of the textbook Hand and Upper Extremity Rehabilitation: A Quick Reference Guide and Review and has presented multiple times on various upper extremity orthopedic topics. She is a member of the American Occupational Therapy Association (AOTA), the Ohio Occupational Therapy Association (OOTA), and the American Society of Hand Therapists (ASHT).